We often hear from businesses who don’t understand why digital marketing is important. We also run into a lot of people who think traditional advertising is dead. The truth is both can help maximize your ROI from marketing. To discuss this and more, we’re joined by Ashley Sica from Green Bench Monthly, a local full-color magazine here in St Pete. Learn about how traditional advertising, like direct mail and print advertising, are far from dead. Ashley tells us about how a print magazine works, how they market themselves, and how their website is also important. We’ll also discuss how print advertising can help local businesses. This is episode 23, “How Traditional and Digital Advertising Can Work Together.” To help us with our discussion today, we’re joined by Ashley Sica from Green Bench Monthly. Green Bench Monthly is a local full-color magazine here in St Pete. It has a circulation of 16,000 homes and businesses and features stories about local residents, businesses, the city, and more. Where should we go from there Mirela? Well I guess here at Kapok Marketing we help people with digital marketing and we always come across different groups of businesses I guess. There's a group of businesses that believe that digital marketing is not important, then there's also a group of people who believe that traditional marketing is dead, and like, print ads and all that stuff are dead, and then we always tell people actually they're both kind of very alive and very important, and we always suggest that people do a mix, and so do you come across people who are like that too? Absolutely! I think there was this whole trend you know, late 90's, early 2000's you know, computers kind of took the world by storm and everybody was looking at that going why would we ever need paper again? This is fantastic! And to a certain degree, yes! Digital is fantastic and it definitely has it's purpose and it can compliment print in a lot of ways, but last year Nielsen released a reports saying that more than two thirds of the population still read some form of print publication, so print isn't dying. It's not what everybody anticipated, so we definitely have a lot of people who still turn to print and I think it's a nice relief from digital. Sometimes starting at the screen all day, it's nice to pick up something that's not moving, something that you can you know, hold on to and you can share. There is something nice and something to be said for that static publication. I agree. I'm a huge book person and everyone's like oh you're so crazy you're not like, reading this stuff on your Kindle or-- I'm like, I don't know, I can't. Yeah to each their own! And sometimes there is a place for a Kindle. I mean, I read on my tablet too. Airplanes, that's nice. There's definitely, there's a nice mix. They compliment each other. I'm definitely more of a person, yeah obviously I don't under a rock, I go online and I do have digital moments, but when I need to unwind, I definitely like to feel something and flip the pages and look at the pictures, which brings me to the next point of, I guess let's talk about, a little bit about Green Bench Monthly and what is it, and anything you can share about the magazine? Sure! We're a community magazine. We publish hyper local content, so we focus on the North East St Pete area. We direct mail to over 15,500 homes in zipcodes 33701, 04 and 13, so that's the bulk of our readership. We also offer subscriptions and we drop off extra copies at local businesses, so there's also an opportunity to get it if you live outside the area. Okay, so who reads magazines, and who reads your magazine? What is that quintessential person? For us it's really about values. It's about people who value the community, are interested in local business, you know I think everybody reads a magazine for different reasons, so for us it's really about St Pete. It's about people who love where they live, they want to get to know their neighbors. We have a column called 'People of St Pete', everybody loves it. It's a chance to get to know, kind of behind the scenes, we feature everybody from you know, trolley drivers to directors of history museums, so it's really kind of up close and personal picture of the people that are living and working in St Pete and I think our readers really enjoy that and value it. Yeah, I definitely get that feel from your magazine and you actually brought in a copy which I guess comes out today. Which is kind of a big deal and before I even actually knew you, this was one of my favorite magazines, and I don't even know how I came across it. I think it was at my previous job when we were in the BBNT building, it somehow ended up in our mail box and I thought well this is kind of cute. And very yeah, not like super uppity and very like down to earth. We are very local, yes. Grounded local content is what we feature, so it's what's near and dear to our hearts. Well this is, it's definitely one of my favorites. So who is the quintessential business or person who would advertise in your magazine? Primarily local business. If you flip through the pages you'll see it's everybody from local services, we have a cleaning service, an air conditioning services to you know, spas, facials, we have coffee shops, really just local businesses. We do open up space for other advertisers. We don't limit it, but typically what we attract is local businesses. People who are targeting to North East St Pete area. Okay, yeah. So as a local magazine, do you also consider yourself a small business? What are your challenges as a small business? How do you keep this thing going? What are the ups and downs, and the good and the bad? relevant and fresh and you feel like you're getting something new each month that you haven't see before, and yeah, it definitely keeps us on our toes. And I think you guys do a really good job with keeping it fresh and relevant. Every time I get an issue, I learn something new. And then I always like, steal it and then I use it on conversations with my friends. And my friends always think that I'm like, this connected person who's in the know. But I really just read your magazine and which kinda of reminds me, not long ago I went to a marketing conference in Boston and there was this keynote speaker who talked about stories and how stories are peoples currency for having conversations and I feel like your magazine is kind of like that. Even when you guys did a story about us as a marketing agency back in the day, a few months ago, maybe it has been like a year. I think it was almost a year. You guys are due for another one. What is going on? The response that we got was amazing. Like people were calling us and just saying you know, I read the story, I think that you guys are a great match for us, and I'm like, oh my God, like us? How did you hear about us? And it was your magazine. Yeah those stories are great. It really gives people an opportunity to get to know you on a level that they wouldn't otherwise from you know, maybe just seeing an ad on Facebook, or hearing a bit on the radio, we run you know, full feature stories about the businesses that advertise with us, so it's a great opportunity for our readers to you know, get to know more about your business, why you do what you do, you know, meet your team. We have photographers that go out and take photos, so it's really kind of a documentary style process and you know, I think there's a lot to be said for that. People like to establish that connection before they make that first call or inquire you know. It kind of does a lot of the sales work for you. Yeah, it was amazing. I definitely was shocked. I thought like, well no one's gonna care to read about us, like who are we? No one! It was really interesting the people who contacted us. We had an inventor, some other small business owners, they were saying they read the magazine all the time and they just found us in there and called us and it was crazy. We have, St Pete, has so many interesting people. I really love talking to our readers and getting that kind of feedback. So we have a lot of talented people that live out here, so it's fun. It's definitely crazy and in a good way, not in a bad way. But yeah, it's definitely one of my favorite magazines here locally, so I think you do a great job. Aw thanks. We love you guys. So maybe we should talk a little bit about your website too. You guys have a pretty nice website. Is it that same content that's in the magazine that's on the website, or what do you guys use the website for? about business owners reading the other business features and really looking for services that cater to their business, so we figured we would start another section on the website that was dedicated solely to that. I know! It's so crazy because you think like, oh it's a business, it's like this faceless thing and like, whatever. This big corporate giant, yeah. Exactly and recently I was at Creative Mornings and they had some, and I don't remember this guy's name, so hopefully people don't think I'm an A hole, but he was talking about how business owners are often very lonely and because, it's just you and you feel like oh my God I'm sitting in this box and I don't know, like I don't have anyone to talk to, and that's probably why they've come to you and said you know, we want like, hear more. Yeah I think so. That connection is really important and I think there's something to be said for getting to know people, or knowing what's offered in your neighborhood, or your community. You know, St Pete is very close knit, so rather than just going online and doing some you know, random search pulling up anything, you know, you have this one source that you can kind of trust that you can turn to, so yes, community is definitely very important, and feeling supported in that way is a vital part to business too. To touch on what you were saying that corporations are people. In St Pete they really are very small, it's very local, there's a lot of one person, two people small businesses, so it really is just a person a lot of the time. Yeah, I agree. It can get a little bit lonely. Yes. Especially long days, pressed time. Oh my gosh! It's like, I wanna sell everything and run away. I don't have those moments anymore, but in the beginning I did. Yeah, it can be tough. It's really tough to you know, get your name out there and get the ball rolling. Yeah, and it seems so much easier just to sell everything and become like, an Instagram like, whatever person. I know, it does look like a good life doesn't it? Like, why am I not in Dubai? Ah St Pete, St Pete is beautiful though. I constantly remind myself that people vacation here and that this is you know, it looks like a post card sometimes. I have to pinch myself that this is home, so it's beautiful. I think we sometimes take it for granted. At least I do, because I've lived here for so long and it's just St Pete. I know St Pete when is was just little old St Pete and like, nothing was happening. I know and then I forget. I walk outside, it's like oh St Pete is kind of like. But yeah, it can get lonely as a business person, so I think it's nice that you've launched something where businesses can share with each other and that's something that we tried to do with our blog posts on website. We try to offer as much information that people can use. Maybe someone can not afford to hire a marketing agency, but maybe they will find one of our blog posts and it will help them. Absolutely. You guys do such a great job. I know I've learned so much just from the posts coming through about digital marketing and just tips, even outside of that, it's really a wealth of knowledge and resources, so I appreciate it. Thank you Jake, it's working. You know sometimes blogging can be like, oh my God, like. I know, sometimes I'm just like, not feeling it. Like, I'd rather go to like, Kahwa and drink coffee than like write this blog post. We'll take the dogs to the park. Yeah, you just gotta step away and tune out for a little bit otherwise I think you get kind of caught in this you know, hamster wheel of trying to you know, just churn it out to put it out and for us, you know, it's really important that you keep the quality up and that you know, and sometimes the answers come to you too. You know, you'll step away and it's like Oh! That's what I was looking for, so it's nice to take time for that space. Every time I have a blog post, I'll be like peace out guys. I'm just always up til midnight every Sunday 'cause I have a blog post that's due at eight AM on Monday. This is something that I have tried to get Jake to change this thing. I just want him to move the blog post to another day outside of Monday. It's not about the day. If it was Tuesday, I'd be up until midnight on Monday doing it, so it's just, I don't know. Jake comes in on Monday morning and like, the blog post is due at ten o'clock and it's nine and he's all angry and like, I gotta get-- I'm like, just move it to another day! Like, it's bad enough that it's Monday, like now it's like your blog post Monday. Way to start the week Jake. It's like Monday from hell. Just like, move it. Maybe one day. We'll be rooting for you in the meantime. Yeah, it's deadlines too. It's just, you know, you gotta get it done, so for us, we're on the same, you gotta keep on schedule, so you know, we do take breaks and go to the park, but that said, we'll stay up late 'cause stuffs gotta get done, so I think it's finding that balance somewhere in between. Yeah, so how do you guys deal with you know, good enough and on time, and perfect and late, like how do you? Do you have those struggles too? Oh my goodness. Yes! I don't know, at some point, you just gotta say that this is okay and you gotta walk away, so it's not, there's stuff that I find every issue after we go to press that I would have done differently, that you know, wasn't lined up, it wasn't you know, there's something about layout, but I guess that kind of stuff you just kind of safe in the back of your mind for next issue and you just keep doing it better, so you know, if anything, mistakes are bound to happen. You just have to commit to doing it better next time. Turn it in! We struggle with that too, oh my gosh, and Jake is always like the voice of reason, like okay guys like, there's a deadline. This is getting a little bit much. Yeah, and we're all like, but we have other options! Like, no, put them away. I'm a strong proponent of good and on time. Yes, that's healthy, that's good. I am, I don't know, I always think there's more. Yeah but I think it's that balance, so Tony and I are kind the same way where Tony is probably the more good and on time, and I'm more of a you know, let's tear it apart and do it again until it's perfect. And there's nothing saying that tearing it apart and doing it again is even perfect, or gonna make it that much better. Yeah! Sometimes it's just different and so, but I think having that personality combo is really what drives creativity and balance. You know it keeps you pushing forward, but then there's always that one person who's going okay we can be done now. So that's kind of a really healthy, healthy balance to have. That's true. Yeah, I guess you have a point Jake. But I think the balance is what you need though. I think that makes sense. Absolutely, because you know, you can't have too much of just the, you know, always being on time you know. There also takes another person saying hey could we do this differently? So I think it's the driving force and then also the throttle you know. That's true, good point. I never though about it that way. Maybe I did, but maybe not recently. So I guess we should talk about something more serious and which is, how do you market yourself, and how do you keep your readers interested and coming back for more and how do you get more readers and things like that? ly have been lucky in terms of marketing. You know, our biggest marketing is actually our readers sharing it with friends, with family, with business owners, so you know, I feel like we kind of you know, hit the jackpot on that and in terms of how we get people to continue reading it, I think it's just up to us to continue putting out content that people are interested in and that reflects the community, so that's really our biggest goal is that you know, we want people to look at this magazine and say hey, this is a great reflection of St Pete, it's inclusive, it features local business and you know, I can take away a little piece of history from it and you know, if people can say that, I consider my job well done. Yeah, I would agree with that, and also I guess it makes it easier to sell ads in your magazine. I'm assuming that businesses just call you. Our readers are our biggest sales people. That's the best kind of sales. Yeah and she has experience with her own publications, so she's been a great addition to our team, so you know, I think it takes a multifaceted approach. There's definitely a few ways that sales come in and our readers are a big part of that. Yeah, I mean that's kind of a big deal, so you have one more person on your, you've added more people to your team. And she probably knows people who know people, who know people. Absolutely! She definitely knows a lot more people than I do. Yeah, she's very well connected in St Pete. That's really really awesome. Well congratulations. Yeah, we're excited. Team's growing. And more amazing, at least for me, I like to have a lot of people around me. I just don't like working by myself. It's just lonely. You kinda have to have your quiet moment. Yeah exactly, you have to focus. That makes sense. If you have too many people it's too loud. Absolutely. But no, when we first started the magazine we were anticipating you know, having just a few writers and one editor and you know, really keeping our team small and it's been the opposite of that. We actually collaborate with a lot of, a lot more people than we originally anticipated, so it's fun. I really enjoy cross promoting and all the different people we've had the opportunity to meet, it's really special. Yeah, it's impressive. I think it's awesome and also impressive to do all this. No it's good! It's really good. It's pretty legit and like, polished and not a hot mess . It's like a publication I like. Is there anything else we wanna discuss Jake? I think we've covered most of it. Is there anything else we should have asked you about that we haven't? Or anything else you wanna talk about? I don't think so. Other than the fact that this magazine really wouldn't work without a community like St Pete. We really feel lucky to live here and publish here and we're grateful for our neighbors and all the local businesses and organizations we have, it's really, that is the biggest driver of our content and biggest reflection of our community. And if there's anyone out there that maybe isn't getting the magazine right now, and they're interested, or they're interested in advertising, you know, how should they get in contact with you? They can visit our website Green Bench Monthly There's a button to click ”Get My Copy”, we have a couple of ways you can sign up digital subscriptions, we offer mailed subscriptions, and then you can also pick up a copy from local businesses. Alright, sounds good. Thank you for joining us today. Thanks you guys. Thanks for having me. And with that, it’s been a great 23rd episode. We’d like to again thank Ashley Sica for joining us today. Feel free to reach out to us if you have any questions or comments about anything we talked about today or marketing in general. 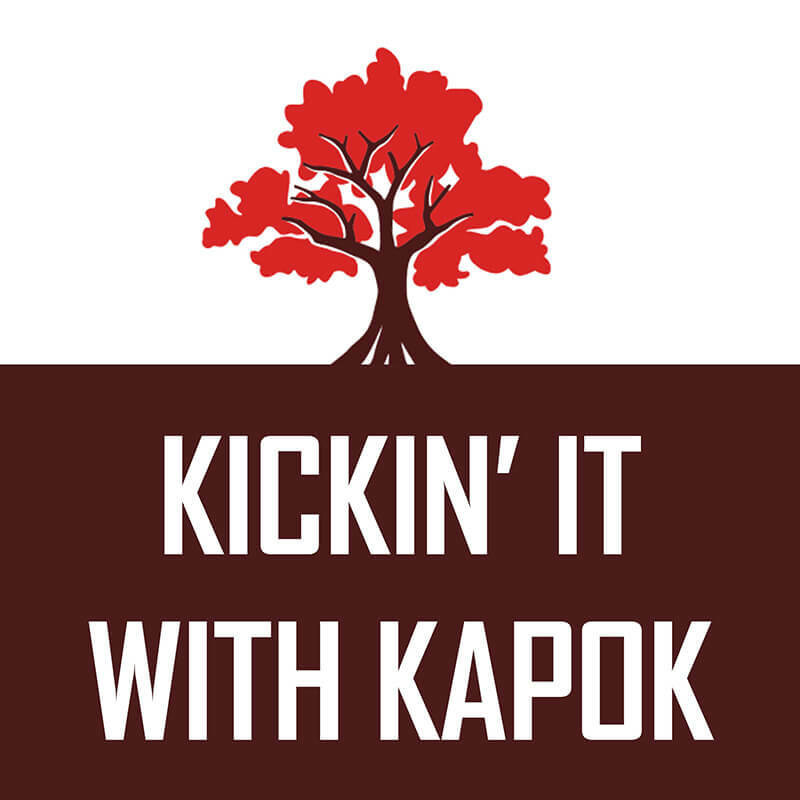 KickinItWithKapok.com, or on social media. We're on Facebook, Instagram and Twitter as Kapok Marketing.